Here’s a new smoothie idea—fennel! 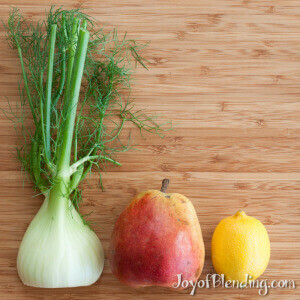 Fennel is similar in flavor to anise and licorice. I found the flavor to be distinct without being overpowering. (Note that many people who dislike black licorice end up enjoying fennel.) If you’re looking for variety in your smoothies, give it a try. 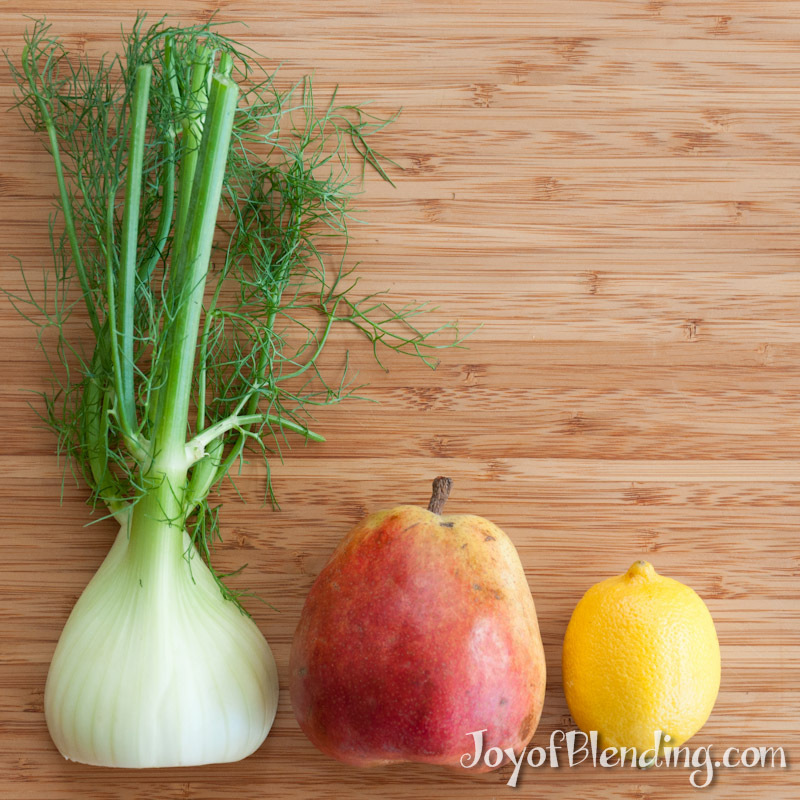 I kept this recipe simple so that the fennel doesn’t get tangled up with too many other flavors. 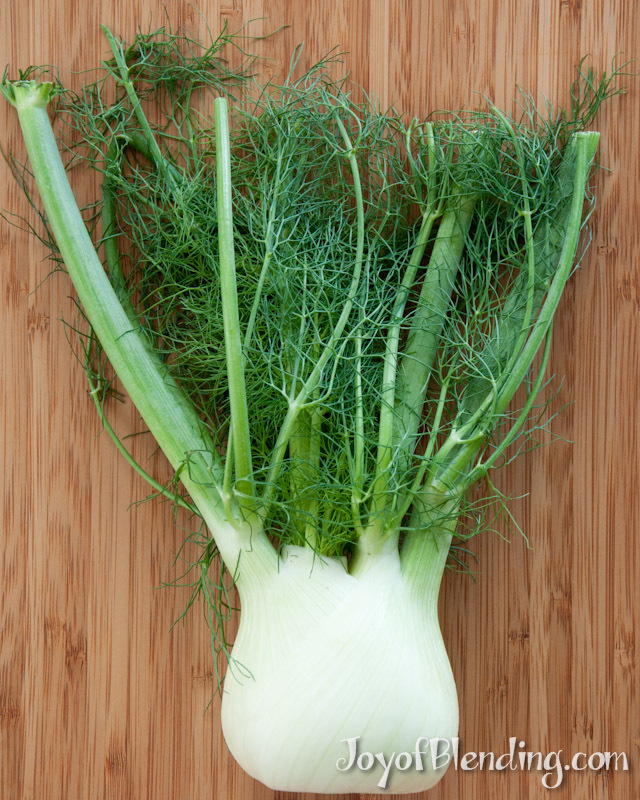 In case you’re having trouble finding it, fennel is sometimes sold as anise. (Interestingly, even though they have a similar flavor, fennel, anise, star anise, and licorice are all different plants.) Look for clean bright bulbs (without brown spots) and fresh-looking fronds. It is best to use fennel within the first day or two because its distinct flavor fades. Long-time readers may notice that this is the first time I used pear. 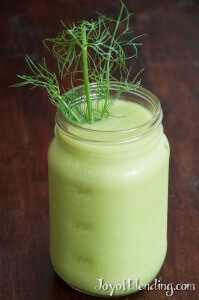 I’m not a huge fan of pear flavor, but I think it goes well in the fennel smoothie. Russ Parsons waxes rhapsodic about pears in How to Pick a Peach, and he shares a few tips about pears. I used a Comice pear, but from his descriptions of varieties I am tempted to try again with a Bartletts for its “buttery texture and … mild, sweet flavor.” He mentions that the Comice has a “slightly granular texture,” which was slightly detectable in the final smoothie. Pear skin is delicate, and some scuffing is OK. You can buy hard pears, as they will ripen at room temperature—ideally use them when they are a bit soft. USA Pears advises to “Check the Neck for Ripeness.” If you want to speed ripening, put pears in a paper bag. Once ripe, store pears in the refrigerator if you’re not using them right away. Can we substitute apples if pears are not available? Yes, that should work fine. Given the choice I’d go with pear though. This smoothie is also good with a bit of pineapple instead of the lemon. Recipe states fronds & bulb – – does fronds include the stalk ? – or just the feathery fronds? Yes, by fronds I meant the stalks and feathery bits. I guess some people distinguish between those parts. The stalks are the most fibrous part, and are the reason I suggest blending for a bit longer than a typical smoothie cycle.